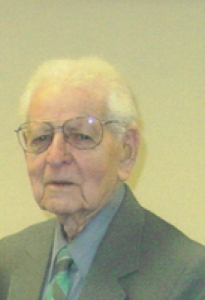 William F. Baumann, 100, Fair Haven Shelby County Home, Sidney, Ohio died at the nursing home on Monday, August 6, 2007 at 10:30 AM after failing health. He was born April 29, 1907 in Sidney, Ohio the son of William H. and Margaret (Miller) Baumann. On August 24, 1931 he married Wilma Crusey and she died in 2000. Surviving are two sons, Dr. Tim Baumann and wife Janice of Sidney and Dr. William James &quot;Jim&quot; Baumann and wife Mary of Anacortes, Washington; seven grandchildren and nine great-grandchildren. Two sisters and two brothers are deceased. He was a graduate of Holy Angels High School and a past member of the Sidney Elks and a member of Holy Angels Catholic Church. He had worked at Monarch in Sidney for twenty years and Stolle Corp. in Sidney for twnety years where he retired as an office worker. A Mass of Christian Burial will be held on Wednesday, August 8, 2007 at 10:30 AM at Holy Angels Catholic Church with Rev. Patrick McMullen. Burial will be at Graceland Cemetery. Friends may call at Salm-McGill and Tangeman Funeral Home on Wednesday from 9:00 AM until 10:00 AM. Memorial contributions may be made to Holy Angels Catholic Church, 324 S. Ohio Ave., Sidney, Ohio 45365.